The 2018 Chevrolet Bolt is an electric vehicle suitable for families, for commuters, for vacation travelers, and for conservative spenders. In short, the Bolt EV doesn't just compete with other electric vehicles, it competes with gas-powered cars. Among affordable EVs, it has the longest driving range. The incredible power outlay of its electric motor and battery set it apart from its challengers. Let's see how it can serve you. The Bolt comes in LT and Premier trims. Every model has a Chevy MyLink touchscreen with Apple CarPlay and Android Auto. Using either of these smartphone systems, you can stream navigation apps to your 10.2-inch diagonal screen which rests on a floating center stack. This arrangement permits more front row knee room. A large greenhouse, high-mounted SUV-like seating, and a high roof create an airy feel. The panoramic view is a plus for driver visibility. The battery is spread out flat, allowing for a flat floor. This is especially important in the backseat where riders get more legroom. Engineers used thin-frame front seats to permit more rear knee room. 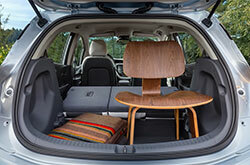 The cabin measures 94.4 cubic feet, providing more passenger space than the Toyota Prius (rated at 93.1 cu.ft.). Measuring 16.9 cubic feet, the Bolt's cargo hold also offers the advantage of a wide-open frame for easier loading. 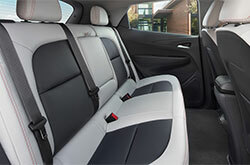 A split-fold rear seat is standard, and Premier editions add a sub-floor storage compartment. Premier models help you beat winter with a heated steering wheel, front heated seats and rear heated seats. Premier extras include a Bose audio system and rear USB ports. Passengers will appreciate the available Wi-Fi hotspot from OnStar. 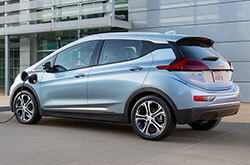 Setting a new standard for affordable EVs, the Bolt has a 238-mile driving range. The all-electric system earns 119 mpg-equivalent. While both of these stats are impressive, the most exciting statistics are its performance ratings. The 2018 Chevrolet Bolt generates 200 horsepower, a solid amount for this lightweight package. Even better, the Bolt generates 266 lb.-ft. of torque. That allows for serious competitiveness in busy traffic. Electronic Precision Shift manages the overall power outlay and prevents the Bolt from wasting energy. Brake regeneration captures energy used during braking. In slow-and-go traffic, this decreases the drain on the battery by recognizing the brake-accelerate-brake pattern. Drivers enjoy responsive handling, which is improved by the vehicle's aerodynamic build and low center of gravity. If you need to charge on the go, a DC Fast Charger takes only thirty minutes to generate 90 miles of range. Chevrolet stands behind the vehicle's battery pack with an eight-year/100,000-mile warranty. 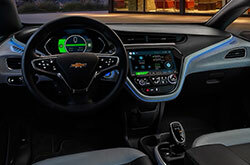 Chevy Bolts have ten airbags and a list of crash avoidance features that includes an exclusive rear view camera mirror system. When you activate the rear camera, it projects a full view to your center mirror. You can see every car without being blocked the rear pillars. Other protections include a rear cross-traffic alert to complement the standard rearview camera system, a blind spot monitor, a lane change assist, a lane departure warning, and a parking assist. A following distance indicator complements a low-speed automatic braking system which watches for forward collision dangers and pedestrians. OnStar can provide automatic emergency notification if the airbags deploy. You'll want to take a closer look at the 2018 Chevrolet Bolt, available now from David Maus Chevrolet. Change your dependence on gasoline without sacrificing style, space, performance, or features.